It has been a while since the last few hours of clear skies from my backyard, but now I had another chance. I decided to go for a bi-color image of the Eastern Veil Nebula using Ha and OIII data. 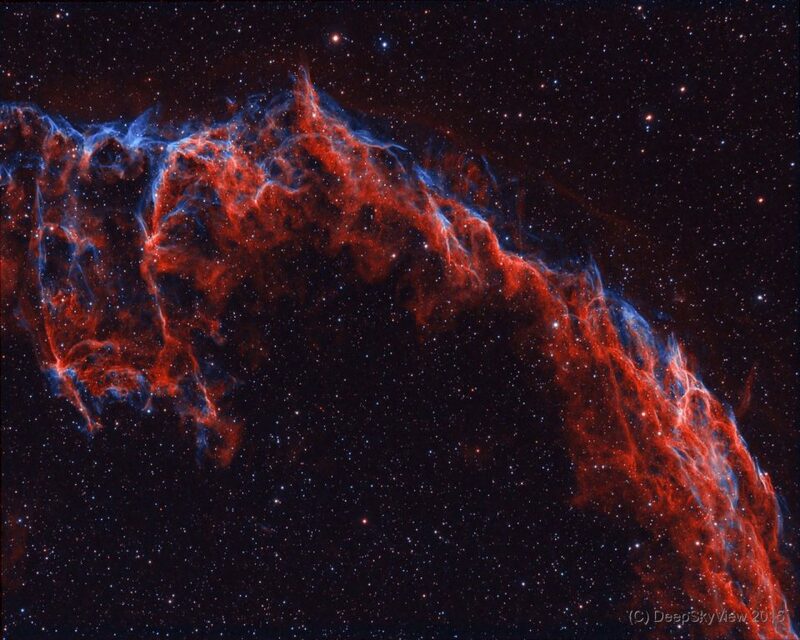 The Veil is one of the largest and most spectacular supernova remnants. The supernova that created it has exploded 8000 years ago and the remnant has been expanding since then. The entire nebula is 110 light-years across, covering six full moons on the sky as seen from Earth, and resides about 2100 light-years away in the constellation Cygnus. The bi-color image is of 20 x 300 sec of Ha and 14 x 300 sec of OIII data. Captured with my Triplet APO 115/800 and the Atik 460EXm using Baader Filters. I went for a basic and contrasty red/blue color scheme, which highlights the intricate structures and filaments in this nebula. Maybe I will come back to this target for a two-panel mosaic. This was also the first serious test for my new field-flattener… still some room for improvement.